When thirteen23 was working on FRICKbits, we knew it was going to be difficult to generate Laurie’s color treatments using software. 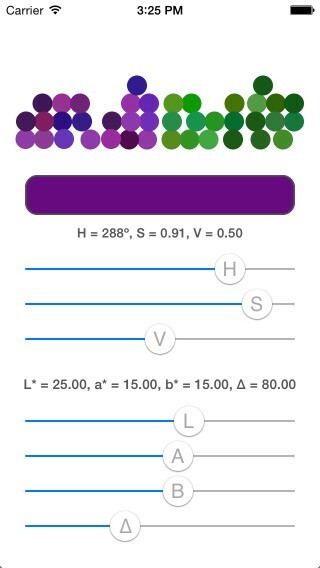 Particularly challenging was the need to create an adaptable color palette from a specific “seed” color in the app. The following is a brief description of our initial approach to solving this problem. You can find our sample app, ColourPalette, on GitHub. Launching ColourPalette reveals a number of different controls that can be effected to change each set of colors (i.e., palette). H, S, & V controls the Hue, Saturation, & Value. The heuristic for our palette generation is admitedly a bit crude, but dealing with color palette generation is never an exact science. For starters, the CIELAB colorspace is a human-perceived colorspace with 3 dimensions. These three dimensions actually form an ellipsoid that’s shaped more like deflated soccer ball than anything. Our algorithm works by taking a seed color, translating it into CIELAB colorspace, and then bounding it by a randomly derived (from the delta values above) mini-ellipsoid. It then generates random points within that ellipsoid until it acquires a valid neighbor color. It’s possible to derive colors that sit outside the spectrum of sRGB so this method is implemented asynchronously so that it can loop and filter results until it determines matches for the ∆ value. But forget all the math — just give it a try!